Purpose: Frailty is an important consideration in the management of lower urinary tract symptoms and erectile dysfunction in older men; frailty increases vulnerability to treatment-related adverse outcomes, but its burden is not known. The authors aimed to examine the burden of frailty and associated geriatric conditions in community-dwelling older men. Patients and methods: A cross-sectional study was conducted with 492 community-dwelling older men (mean age, 74.2 years; standard deviation, 5.6 years). All the participants were administered the International Prostate Symptom Score (IPSS) (range: 0–35) and a five-item version of the International Index of Erectile Function (IIEF-5) (range: 5–25). Frailty phenotype was assessed based on exhaustion, inactivity, slowness, weakness, and weight loss. Prevalence of frailty phenotype and geriatric conditions were assessed by the IPSS severity category (mild, 0–7; moderate, 8–19; severe, 20–35 points) and the first IIEF-5 question, which assesses the confidence in erectile function (low, 1–2; moderate, 3; high, 4–5 points). Results: Older men with severe urologic symptoms had a high prevalence of frailty. According to the IPSS questionnaire, the prevalence of frailty was 7.3% (21/288) in the mild category, 16.3% (26/160) in the moderate category, and 43.2% (19/44) in the severe category. Participants in the severe IPSS category showed high prevalence of dismobility (45.5%), multimorbidity (43.2%), malnutrition risk (40.9%), sarcopenia (40.9%), and polypharmacy (31.8%). According to erectile confidence based on the first IIEF-5 question, the prevalence of frailty was 18.7% (56/300) for low confidence, 5.3% (6/114) for moderate confidence, and 5.1% (4/78) for high confidence. Participants with low confidence in erectile function showed high prevalence of sarcopenia (39.0%), multimorbidity (37.7%), dismobility (35.7%), malnutrition risk (33.3%), and polypharmacy (23.0%). Conclusion: The prevalence of frailty and geriatric conditions was higher in older men with severe urologic symptoms. A frailty screening should be routinely administered in urology practices to identify older men who are vulnerable to treatment-related adverse events. While proper treatments of LUTS and ED can improve the well-being of older men,9 they are not without risks.6,10,11 Medications for LUTS, such as alpha-blockers and antimuscarinics, can worsen orthostatic hypotension and cognitive impairment.10 Transurethral resection of the prostate (TURP) can increase the risk of bleeding, delirium, and TURP syndrome, which is associated with morbidity, mortality, prolonged hospitalization, and costs.12,13 These risks may be particularly elevated in older men with frailty,14 that is, in individuals who have decreased physiologic reserve and increased vulnerability to acute stressors. Therefore, recognizing frailty and geriatric syndromes in older men with urologic symptoms is crucial for the optimal management and prevention of treatment-related adverse events. However, the burden of frailty and geriatric conditions in community-dwelling older men with urologic symptoms is unknown. We conducted a cross-sectional study to evaluate the burden of frailty and geriatric conditions according to the severity of LUTS and ED in community-dwelling older men. We administered two widely used questionnaires to assess LUTS and ED, the International Prostate Symptom Score (IPSS) and the five-item version of the International Index of Erectile Function (IIEF-5),15,16 respectively. We hypothesized that severe symptoms of LUTS and ED are associated with frailty and geriatric syndromes. The Aging Study of PyeongChang Rural Area (ASPRA) is a population-based, prospective cohort study of frailty and geriatric syndromes in 1,350 community-dwelling older adults residing in PyeongChang, Gangwon, Korea.17 The design and conduct of ASPRA cohort are described elsewhere.17 Briefly, since the cohort was established in October 2014, participants have undergone annual assessments of medical, physical, and psychosocial status. The inclusion criteria for participation in ASPRA were 1) age ≥65 years; 2) registered in the National Healthcare Service; 3) ambulatory with or without an assistive device; 4) living at home; and 5) able to provide informed consent. Those who were living in a nursing home, hospitalized, or bed-ridden and receiving nursing-home-level care at the time of enrollment were excluded. The study enrolled 95% of eligible people in the study regions. The characteristics of ASPRA participants were overall similar to those of the Korean rural population represented in the Korea National Health and Nutrition Examination Survey.17 Of the total of 498 men who completed the comprehensive geriatric assessment between January 1, 2016 and December 31, 2016, 492 (98.8%) were assessed for LUTS and ED. The protocol of this study was approved by the Institutional Review Board of the Asan Medical Center. All the participants provided written informed consent. The IPSS and IIEF-5 questionnaires were administered to the participants by male physicians in a privacy-protected area. We evaluated sexual desire (ie, libido) and ED using a five-item version of the IIEF (also known as the Sexual Health Inventory for Men)16 with a scoring range of 5–25. However, since many participants were not sexually active, we focused on the first IIEF-5 question – “How do you rate your confidence that you could get and keep an erection?” – that assesses the confidence in the erectile function, regardless of their sexual activity. Based on the first IIEF-5 question, we classified the participants as low (1–2 points), moderate (3 points), or high confidence (4–5 points). Frailty was assessed according to the Cardiovascular Health Study frailty criteria, a widely validated definition for frailty.18 The frailty phenotype scale is calculated by assigning 1 point to the following five components that are relevant to a given individual:18 1) exhaustion: moderate or most of the time during the last week, to either of the following: “I felt that everything I did was an effort” or “I could not get going”; 2) low activity: lowest quintile in physical activity level measured using International Physical Activity Questionnaires Short Form (below the 20th percentile cutoff point in a representative sample of older Koreans in the Korea National Health and Nutrition Examination Survey [KNHANES]); 3) slowness: usual gait speed <0.8 m/s from 4-m walk test; 4) weakness: dominant handgrip strength <26 kg for men, <17 kg for women; and 5) weight loss: unintentional weight loss >3 kg during previous 6 months.19,20,33 On the basis of the total score, individuals were classified as robust (0 points), prefrail (1–2 points), or frail (3–5 points). We summarized the characteristics of our study participants according to the mean and standard deviation (SD) for continuous variables and proportions for categorical variables. We evaluated the prevalence of the frailty phenotype and its components according to the severity categories of the IPSS and the first IIEF-5 question. The proportion of frailty and its component was compared across the severity category using a logistic regression to adjust for age. The odds ratio (OR) and 95% confidence interval (CI) of frailty across the severity category were also estimated. Statistical analyses were performed using SPSS version 21.0 (IBM Corporation, Armonk, NY, USA). A two-sided p-value <0.05 was considered statistically significant. The mean age of the 492 men was 74.2 years (standard deviation: 5.6) (Table 1). Most men were prefrail (73.2%) or frail (13.4%), and multimorbidity (32.5%), low cognition (16.7%), IADL disability (15.7%), and fall history (13.0%) were common. The most prevalent underlying diseases diagnosed by physicians were hypertension (48.8%), arthritis (22.6%), diabetes (17.3%), heart disease (11.2%) and chronic lung disease (7.5%). Alpha-blockers, 5-alpha-reductase inhibitors, or anticholinergics were used by 117 men (23.8%). 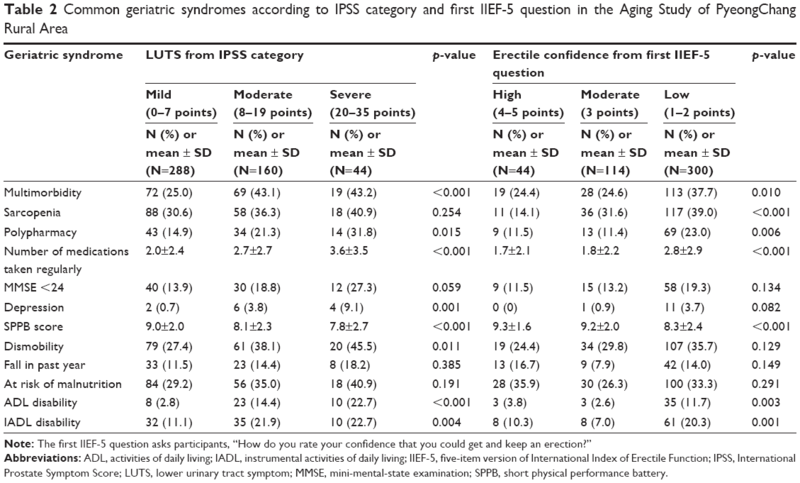 The IPSS questionnaire classified 288 men (58.5%) as mild, 160 (32.5%) as moderate, and 44 (8.9%) as severe for LUTS symptoms. According to the first IIEF-5 question, which assesses the confidence in erectile function, 300 men (61.0%) had low confidence. Abbreviations: ADL, activities of daily living; BPH, benign prostatic hyperplasia; CHS, Cardiovascular Health Study; IADL, instrumental activities of daily living; IIEF-5, five-item version of International Index of Erectile Function; IPSS, International Prostate Symptom Score; MMSE, mini-mental-state examination; SPPB, short physical performance battery. The prevalence of frail and prefrail states increased with greater IPSS severity (Figure 1A). Frailty was present in 21 of the 288 men (7.3%) with mild symptoms, 26 of the 160 men (16.3%) with moderate symptoms (OR: 2.47; 95% CI: 1.34–4.55; p=0.004), and 19 of the 44 men (43.2%) with severe symptoms (OR: 9.66; 95% CI: 4.59–20.33; p<0.001). Similarly, the prevalence of frailty was higher in the lower erectile confidence categories according to the first IIEF-5 question (Figure 1B). Frailty was identified in four of 78 men with high confidence (5.1%), six of 114 men (5.3%) with moderate confidence (OR: 1.03; 95% CI: 0.28–3.77; p=0.967), and 56 of 300 men (18.7%) with low confidence (OR: 4.25; 95% CI: 1.49–12.10; p=0.007). Each component of frailty increased in prevalence with higher severity according to IPSS (Figure 2A) or the first IIEF-5 question (Figure 2B). Figure 1 Frailty status according to IPSS category (A) and the first IIEF-5 question (B). Notes: IIEF-5 first question asks participants, “How do you rate your confidence that you could get and keep an erection?” (A) LUTS from IPSS category; (B) Erectile confidence from the first IIEF-5 question; Frailty status was defined by Cardiovascular Health Study frailty criteria. We defined 0–7 points of IPSS score as “mild”, 8–19 points as “moderate”, and 20–35 points as “severe” LUTS. We also defined 4 or 5 points of the first IIEF-5 question as “high”, 3 points as “moderate”, and 1 or 2 as “low” erectile confidence. Abbreviations: IPSS, International Prostate Symptom Score; IIEF-5, five-item version of International Index of Erectile Function; LUTS, lower urinary tract symptom. Figure 2 Frailty components according to IPSS category (A) and the first IIEF-5 question (B). 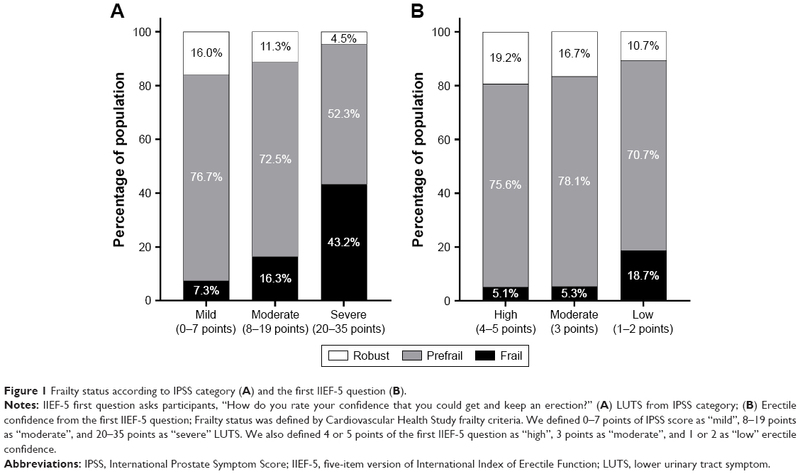 Notes: The first IIEF-5 question asks participants, “How do you rate your confidence that you could get and keep an erection?” (A) LUTS from IPSS category; (B) Erectile confidence from the first IIEF-5 question; Frailty components originated from Cardiovascular Health Study frailty criteria. We defined 0–7 points of IPSS score as “mild”, 8–19 points as “moderate”, and 20–35 points as “severe” LUTS. We also defined 4 or 5 points of the first IIEF-5 question as “high”, 3 points as “moderate”, and 1 or 2 as “low” erectile confidence. We also investigated the common geriatric conditions according to the severity as determined by each urologic questionnaire (Table 2). The prevalence of most geriatric conditions was higher as the severity of LUTS increased. Close to a half of the individuals with severe IPSS symptoms had dismobility (45.5%), multimorbidity (43.2%), malnutrition risk (40.9%), or sarcopenia (40.9%). The severe LUTS group showed significantly high prevalence of multimorbidity (43.2% of severe LUTS group; 43.1% of moderate group; 25.0% of mild group; p<0.001), polypharmacy (31.8% of severe LUTS group; 21.3% of moderate group;14.9% in mild group; p=0.015), and the mean number of regular medications taken regularly (3.6 tablets [SD 3.5] in severe LUTS group; 2.7 tablets [SD 2.7] in moderate group; 2.0 tablets [SD 2.4] in mild group, p<0.001) than low LUTS group. Abbreviations: ADL, activities of daily living; IADL, instrumental activities of daily living; IIEF-5, five-item version of International Index of Erectile Function; IPSS, International Prostate Symptom Score; LUTS, lower urinary tract symptom; MMSE, mini-mental-state examination; SPPB, short physical performance battery. Similarly, geriatric conditions were more prevalent in those with low erectile confidence: sarcopenia (39.0%), multimorbidity (37.7%), dismobility (35.7%), and malnutrition risk (33.3%) were common. Compared to the group of high confidence of erectile function, the group of low confidence of erectile function showed significantly high prevalence of multimorbidity (37.7% in the group of low confidence of erectile function; 24.6% in the group of moderate confidence; 24.4% in the group of high confidence; p=0.010), polypharmacy (23.0% in the group of low confidence of erectile function; 11.4% in the group of moderate confidence; 11.5% in the group of high confidence; p=0.006), and the mean number of medications taken regularly (2.8 tablets [SD 2.9] in the group of low confidence of erectile function; 1.8 tablets [SD 2.2] in the group of moderate confidence; 2.7 tablets [SD 2.1] in the group of high confidence; p<0.001). A majority of patients seeking medical or surgical treatment for moderate or severe LUTS are older men, and our study indicates that almost a half of these patients satisfy the criteria for frailty. Given that frail older adults may have increased vulnerability to treatment-related adverse events, our findings suggest the importance of recognizing frailty in older men with severe LUTS symptoms through a validated frailty assessment in the management of urological symptoms in these patients. Because frail older men may be at high risk of adverse events from LUTS or ED treatment, our results indicate the importance of recognizing frailty in the management of common urological symptoms in older men. In geriatrics, a number of frailty instruments have been developed and validated. Some of the widely validated instruments include the frailty phenotype, a deficit accumulation of frailty index, and the FRAIL (Fatigue, Resistance, Ambulation, Illnesses, Loss of weight) scale. The frailty phenotype that we used was developed from a large community-based cohort of older adults in the United States18,32 and subsequently validated in several other populations.33–35 It is based on the assessment of five specific components that require certain skills and administration time (in our experience, 10–15 minutes). The frailty index developed by Rockwood and Mitnitski originated from a large population-based Canadian cohort.36 It calculates the proportion of deficits from a total of 30–90 health deficit variables. Rather than these extensive evaluations, we recommend that urologists and primary care physicians adopt the FRAIL scale, which is a brief screening tool based on five self-reported items.37 This has been validated for the US,37 European,38 and Asian populations.39 It classifies participants as robust (0 points), prefrail (1–2 points), or frail (3–5 points). This questionnaire does not require a physical examination and can be administered within 3 minutes.39 Frailty screening improves prediction of older adults at high risk for poor surgical outcomes,40–43 but few studies examined this in older men undergoing urological procedures.14,32 Further studies are warranted to define the role of frailty screening in determining the risk–benefit of the urological procedures in older men. There are several strengths and limitations to our study. The ASPRA is a population-based prospective cohort study that administered standardized measurements for frailty and an extensive list of geriatric syndromes in addition to the IPSS and IIEF-5 questionnaires.17 Because our study population had a high participation rate of eligible men residing in the study regions, selection bias due to non-participation is unlikely. Although the ASPRA cohort was based on a rural community in Korea, we previously showed that their demographic characteristics are similar to a nationally representative sample.17 However, the results from this study may not be generalized to nursing homes or populations of other ethnic origins. As a cross-sectional study, we were not able to determine whether the IPSS scores and the response to the first IIEF-5 question can predict the future development of frailty in older men and whether frailty can predict the worsening of urological symptoms in the future. The long-term follow-up data from the ASPRA cohort will be valuable to answer these clinically important questions. Our study underscores the high prevalence of frailty and geriatric syndromes in older men with severe LUTS or ED. Considering the high prevalence of frailty and its clinical implications, urologists and primary care physicians should consider adopting a simple frailty screening tool for identifying frail older patients who may require careful assessment of benefits and risks of medical and surgical management options for their urological symptoms. Future research on whether a frailty screening and subsequent management based on frailty assessment improve patient-centered care and clinical outcomes in these patients is needed. We are indebted to public health professionals and nurses of PyeongChang County Hospital, Public Health Center, and Community Health Posts for their administrative support and effort in enrollment and measurements. Public health professionals and nurses of PyeongChang County Hospital were involved in data collection, but they did not have any role in the study design, analysis or interpretation of data, writing of the paper, or decision to submit the paper for publication. The ASPRA was supported by PyeongChang County Hospital, PyeongChang County, Gangwon Province, Korea. This study was also supported, in part, by Paul Park and Maeil Dairies Co., Ltd., and by the Asan Institute for Life Sciences and Corporate Relations of the Asan Medical Center, Seoul, Korea. Paul Park and Maeil Dairies Co., Ltd., and the Asan Medical Center did not have any role in the study design, data collection, analysis or interpretation of the data, writing of the paper, or decision to submit the paper for publication. Dr Hee-Won Jung is supported by a Global PhD Fellowship Program through the National Research Foundation of Korea funded by the Ministry of Education (NRF-2015H1A2A1030117). Dr Dae Hyun Kim is supported by the Paul B Beeson Clinical Scientist Development Award in Aging (K08AG051187) from the National Institute on Aging, American Federation for Aging Research, The John A Hartford Foundation, and The Atlantic Philanthropies. All the authors participated in design and study conception, performed statistical analysis, data analysis and interpretation, and drafted the manuscript. All the authors read and revised this manuscript. This manuscript is the final approved version by all authors. All the authors have reviewed and agreed to be responsible for the process, accuracy, and integrity of all the parts of this manuscript. Dr Dae Hyun Kim is a consultant to Alosa Health, a nonprofit educational organization with no relationship to any drug or device manufacturer. The other authors report no conflicts of interest in this work. Sagnier PP, MacFarlane G, Teillac P, Botto H, Richard F, Boyle P. Impact of symptoms of prostatism on level of bother and quality of life of men in the French community. J Urol. 1995;153(3 Pt 1):669–673. Taylor BC, Wilt TJ, Fink HA, et al. Prevalence, severity, and health correlates of lower urinary tract symptoms among older men: the MrOS study. Urology. 2006;68(4):804–809. Rosen RC, Fisher WA, Eardley I, et al. The multinational men’s attitudes to life events and sexuality (MALES) study: I. Prevalence of erectile dysfunction and related health concerns in the general population. Curr Med Res Opin. 2004;20(5):607–617. Seftel AD. Erectile dysfunction in the elderly: epidemiology, etiology and approaches to treatment. J Urol. 2003;169(6):1999–2007. Hunter DJ, McKee M, Black NA, Sanderson CF. Health status and quality of life of British men with lower urinary tract symptoms: results from the SF-36. Urology. 1995;45(6):962–971. Morris V, Wagg A. Lower urinary tract symptoms, incontinence and falls in elderly people: time for an intervention study. Int J Clin Pract. 2007;61(2):320–323. Malavige LS, Jayaratne SD, Kathriarachchi ST, Sivayogan S, Ranasinghe P, Levy JC. Erectile dysfunction is a strong predictor of poor quality of life in men with type 2 diabetes mellitus. Diabet med. 2014;31(6):699–706. Sanchez E, Pastuszak AW, Khera M. Erectile dysfunction, metabolic syndrome, and cardiovascular risks: facts and controversies. Transl Androl Urol. 2017;6(1):28–36. Arai Y, Aoki Y, Okubo K, et al. Impact of interventional therapy for benign prostatic hyperplasia on quality of life and sexual function: a prospective study. J Urol. 2000;164(4):1206–1211. Oelke M, Becher K, Castro-Diaz D, et al. Appropriateness of oral drugs for long-term treatment of lower urinary tract symptoms in older persons: results of a systematic literature review and international consensus validation process (LUTS-FORTA 2014). Age Ageing. 2015;44(5):745–755. Lucenteforte E, Lombardi N, Vetrano DL, et al. Inappropriate pharmacological treatment in older adults affected by cardiovascular disease and other chronic comorbidities: a systematic literature review to identify potentially inappropriate prescription indicators. Clin Interv Aging. 2017;12:1761–1778. Xue P, Wu Z, Wang K, Tu C, Wang X. Incidence and risk factors of postoperative delirium in elderly patients undergoing transurethral resection of prostate: a prospective cohort study. Neuropsychiatr Dis Treat. 2016;12:137–142. Rieken M, Ebinger Mundorff N, Bonkat G, Wyler S, Bachmann A. Complications of laser prostatectomy: a review of recent data. World J Urol. 2010;28(1):53–62. Suskind AM, Walter LC, Jin C, et al. Impact of frailty on complications in patients undergoing common urological procedures: a study from the American College of Surgeons National Surgical Quality Improvement database. BJU Int. 2016;117(5):836–842. Abrams P, Chapple C, Khoury S, et al. Evaluation and treatment of lower urinary tract symptoms in older men. J Urol. 2013;189(1 Suppl):S93–S101. Rosen RC, Cappelleri JC, Smith MD, Lipsky J, Pena BM. Development and evaluation of an abridged, 5-item version of the International Index of Erectile Function (IIEF-5) as a diagnostic tool for erectile dysfunction. Int J Impot Res. 1999;11(6):319–326. Jung HW, Jang IY, Lee YS, et al. Prevalence of frailty and aging-related health conditions in older Koreans in rural communities: a cross-sectional analysis of the Aging Study of Pyeongchang Rural Area. J Korean Med Sci. 2016;31(3):345–352. Fried LP, Tangen CM, Walston J, et al. Frailty in older adults: evidence for a phenotype. J Gerontol A Biol Sci Med Sci. 2001;56(3):M146–M156. Avila-Funes JA, Amieva H, Barberger-Gateau P, et al. Cognitive impairment improves the predictive validity of the phenotype of frailty for adverse health outcomes: the three-city study. J Am Geriatr Soc. 2009;57(3):453–461. Fukutomi E, Okumiya K, Wada T, et al. Importance of cognitive assessment as part of the “Kihon Checklist” developed by the Japanese Ministry of Health, Labor and Welfare for prediction of frailty at a 2-year follow up. Geriatr Gerontol Int. 2013;13(3):654–662. Kang Y, Na DL, Hahn S. A validity study on the Korean Mini-Mental State Examination (K-MMSE) in dementia patients. J Korean Neurol Assoc. 1997;15(2):300–308. Park JH, Kim KW. A review of the epidemiology of depression in Korea. J Korean Med Assoc. 2011;54(4):362–369. Cummings SR, Studenski S, Ferrucci L. A diagnosis of dismobility – giving mobility clinical visibility: a Mobility Working Group recommendation. JAMA. 2014;311(20):2061–2062. Rubenstein LZ, Harker JO, Salva A, Guigoz Y, Vellas B. Screening for undernutrition in geriatric practice: developing the short-form mini-nutritional assessment (MNA-SF). J Gerontol A Biol Sci Med Sci. 2001;56(6):M366–M372. Won CW, Yang KY, Rho YG, et al. The Development of Korean Activities of Daily Living (K-ADL) and Korean Instrumental Activities of Daily Living (K-IADL) Scale. J Korean Geriatr Soc. 2002;6(2):107–120. By the American Geriatrics Society 2015 Beers Criteria Update Expert Panel. American Geriatrics Society 2015 updated beers criteria for potentially inappropriate medication use in older adults. J Am Geriatr Soc. 2015;63(11):2227–2246. Fink HA, Mac Donald R, Rutks IR, Nelson DB, Wilt TJ. Sildenafil for male erectile dysfunction: a systematic review and meta-analysis. Arch Intern Med. 2002;162(12):1349–1360. Wagg A, Gibson W, Ostaszkiewicz J, et al. Urinary incontinence in frail elderly persons: Report from the 5th International Consultation on Incontinence. Neurourol Urodyn. 2015;34(5):398–406. Tannenbaum C. How to treat the frail elderly: the challenge of multimorbidity and polypharmacy. Can Urol Assoc J. 2013;7(9–10 Suppl 4):S183–S185. Landi F, Russo A, Liperoti R, et al. Anticholinergic drugs and physical function among frail elderly population. Clin Pharmacol Ther. 2007;81(2):235–241. Wasson JH, Reda DJ, Bruskewitz RC, Elinson J, Keller AM, Henderson WG. A comparison of transurethral surgery with watchful waiting for moderate symptoms of benign prostatic hyperplasia. The Veterans Affairs Cooperative Study Group on Transurethral Resection of the Prostate. N Engl J Med. 1995;332(2):75–79. Clegg A, Young J, Iliffe S, Rikkert MO, Rockwood K. Frailty in elderly people. Lancet. 2013;381(9868):752–762. Jung HW, Kim SW, Ahn S, et al. Prevalence and outcomes of frailty in Korean elderly population: comparisons of a multidimensional frailty index with two phenotype models. PLoS One. 2014;9(2):e87958. Garcia-Garcia FJ, Gutierrez Avila G, Alfaro-Acha A, et al. The prevalence of frailty syndrome in an older population from Spain. The Toledo Study for Healthy Aging. J Nutr Health Aging. 2011;15(10):852–856. Bieniek J, Wilczynski K, Szewieczek J. Fried frailty phenotype assessment components as applied to geriatric inpatients. Clin Interv Aging. 2016;11:453–459. Rockwood K, Mitnitski A. Frailty in relation to the accumulation of deficits. J Gerontol A Biol Sci Med Sci. 2007;62(7):722–727. Morley JE, Malmstrom TK, Miller DK. A simple frailty questionnaire (FRAIL) predicts outcomes in middle aged African Americans. J Nutr Health Aging. 2012;16(7):601–608. Brooks R. EuroQol: the current state of play. Health Policy. 1996;37(1):53–72. Jung HW, Yoo HJ, Park SY, et al. The Korean version of the FRAIL scale: clinical feasibility and validity of assessing the frailty status of Korean elderly. Korean J Intern Med. 2016;31(3):594–600. Lin HS, Watts JN, Peel NM, Hubbard RE. Frailty and post-operative outcomes in older surgical patients: a systematic review. BMC Geriatr. 2016;16(1):157. Hall DE, Arya S, Schmid KK, et al. Association of a frailty screening initiative with postoperative survival at 30, 180, and 365 days. JAMA Surg. 2017;152(3):233–240. Gleason LJ, Benton EA, Alvarez-Nebreda ML, Weaver MJ, Harris MB, Javedan H. FRAIL questionnaire screening tool and short-term outcomes in geriatric fracture patients. J Am Med Dir Assoc. 2017;18(12):1082–1086. Dal Moro F, Morlacco A, Motterle G, Barbieri L, Zattoni F. Frailty and elderly in urology: Is there an impact on post-operative complications? Cent European J Urol. 2017;70(2):197–205.